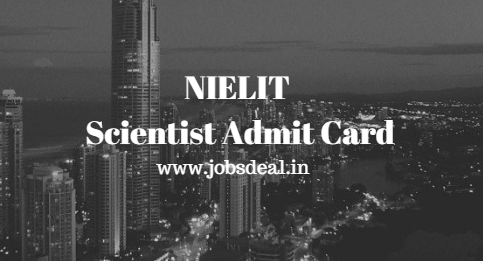 NIELIT Scientist Admit Card 2017, NIELIT Technical Assistant Hall Ticket 2017, NIELIT Scientific Assistant Exam Date 2017. What could be more important when we start talking about getting entry to the exam venue? Is it your NIELIT Scientist Admit Card 2017 without which, there is no entry in the exam hall? Yes, undoubtedly, it is. The NIELIT Technical Assistant Hall Ticket 2017 is to be announced on the behalf of MeitY as well on its website. Being a Scientist is a big dream of many candidates out there and it seems that time is about to come since, in the forthcoming dates, the NIELIT Scientific Assistant Exam Date 2017 will be brought on the site so shall it given on this page. Applicants who showed their interest towards this recruitment are still doubtful because they cannot see the latest news around. National Institute of Electronics & Information Technology, which is headquartered in Delhi, is formerly known as DOEACC Society. The NIELIT scheme was founded during 1990 and the scheme was jointly formed by AICTE and MeitY. According to the reliable resources, this institute has made all of us aware of the current hiring that it is working on. According to the statistics, there are around 340 vacant positions available. So, are you gearing up for taking the test which will be held at 26 different locations? If not yet, be ready for the exam. It is better to have the awareness of the exam syllabus because there is negative marking in the test i.e. for every wrong answer, you will be seeing a deduction of 0.25 marks in the marks you obtain as aggregate. However, the Interview will be conducted at Delhi only. When it comes to the weightage of the Written Exam and Interview, it will be in the ratio of 85:15. You have to prepare for the test very well and keep peace in the exam. Do not use unfair means in the examination premises. You should not misbehave in the exam hall with any examiner or anyone; rather try to be polite everyone else there. Do not bring any cheating material in the test venue. If anyone is caught taking the answer sheet away from the exam hall, there will be severe actions taken against that person. Instructions for downloading NIELIT Technical Assistant Hall Ticket 2017 will be published on the official site some days prior to the exam conduction. Therefore, it is important for you to stay in touch with recent news on our website. For Scientist ‘B’ post, two rounds will be conducted and they are Written Exam followed by Interview. However, for Scientific/Technical Assistant ‘A’, only Written Test shall be carried out. Depending upon the total number of applications received by the institution, there may be a change in the exam center and people may have to appear for the test at other exam centre than the indicated choice. The place of posting reveals that eligible/worthy applicants shall be appointed to the applied post anywhere in India. Getting hold of NIELIT Scientific Assistant Admit Card 2017 is rather stress-free if every step provided our team is followed. Having downloaded the admit card, you need to make sure if all information given in it is correct. If proclamation of Exam Date is taking too much, you should reach out to authority’s site in this concern and collect the recent facts on the same. Log on to the authorized web portal at www.apply-delhi.nielit.gov.in. You will see many links related to this recruitment. Just read out the guidelines and use the link for Hall Ticket for the aforesaid vacancies. You will be asked to enter the details. Provide with such details carefully and press the button to submit them all. Wait for the action taken by the authority and then take a printout of the downloaded admit card. If for some reasons, the link to access the NIELIT Scientist Admit Card 2017 is not opening, you can consult our experts who are always waiting to help the candidates facing problems regarding their careers. Use the comment panel to share your queries with us.